EDINBURG — When RGV Vipers coach Joseph Blair first spoke to the media, his message was simple. The Vipers have long been ahead of the curve, when it comes to analytics and data, and using those numbers to succeed on the court, especially the Vipers’ court. The ‘three true outcome’ style of play — meaning the offense tries to get a three-pointer, a layup/dunk or free throws — which has taken the basketball world by storm, began on the court for the Vipers. The Vipers have been at or near the top of the league in 3-pointers attempted since 2009, back when Stephen Curry was still at Davidson. Last year, the Vipers were third in the G-League in pace, a stat that quantifies the number of possessions per 48 minutes. The Vipers were second in effective field goal percentage, which adjusts for the added value of 3-pointers over twos. They led the league in offensive rating and points scored. 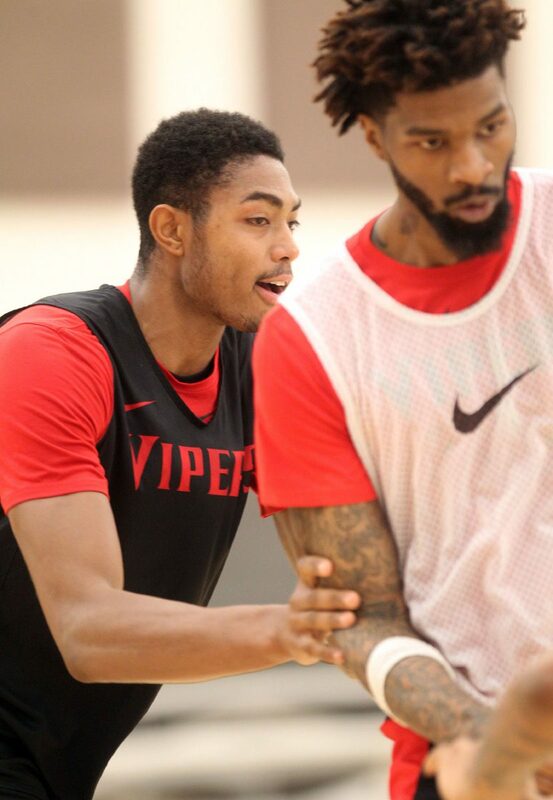 RGV Vipers Bruno Caboclo and Chris Walker during Vipers practice at the RGV Vipers practice facility on Saturday, Oct. 27,2018, in Edinburg. 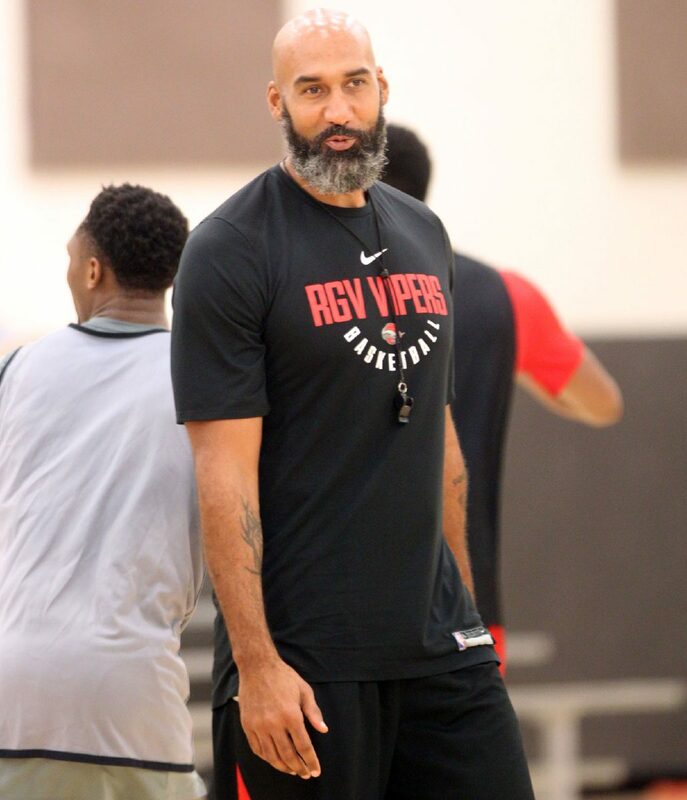 RGV Vipers head coach Joseph Blair during Vipers practice at the RGV Vipers practice facility on Saturday, Oct. 27,2018, in Edinburg. 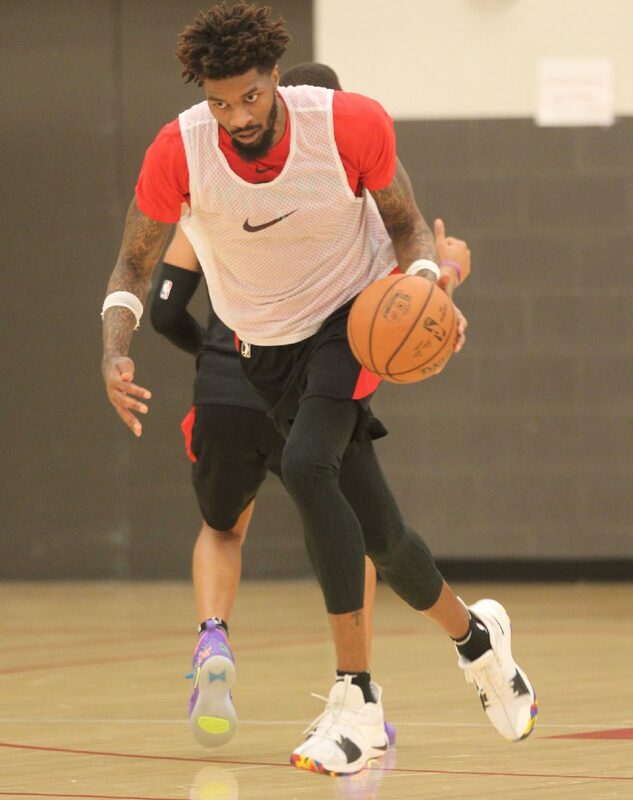 RGV Vipers Chris Walker during Vipers practice at the RGV Vipers practice facility on Saturday, Oct. 27,2018, in Edinburg. 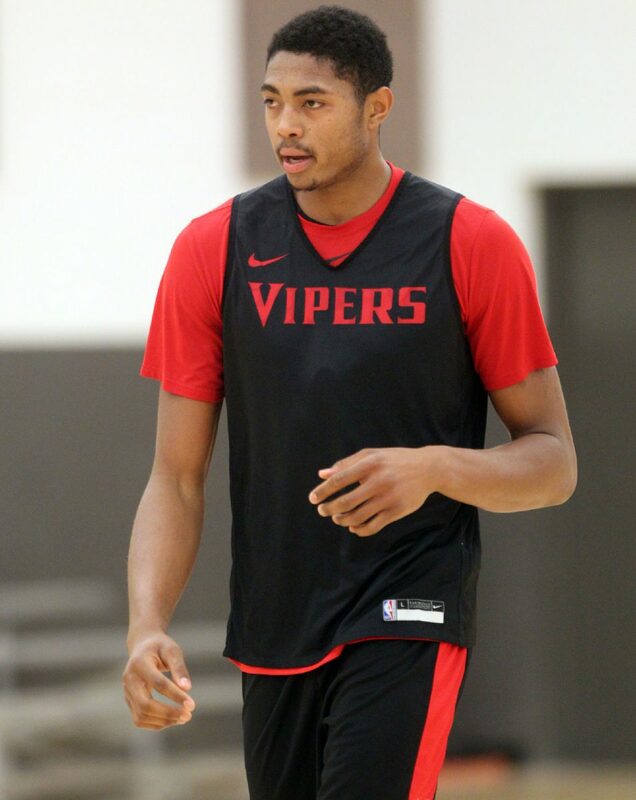 RGV Vipers Bruno Caboclo during Vipers practice at the RGV Vipers practice facility on Saturday, Oct. 27,2018, in Edinburg. The current roster construction lends credence to that point. The Vipers have two forwards listed on their current roster: Chris Walker (6-foot-10) and Bruno Caboclo (6-9). Everyone else is 6-foot-6 or below, and they will need to be ready to run. It is always worth noting, the flexibility of a G-League team’s roster means Blair could roll out two entirely new forwards by their second game, but the intent behind the roster design is as much a reflection of what the team looks like now, as it is an indication of what the core philosophies of the 2018-2019 Vipers under Blair might be. Walker played with the Vipers last year and led the team with 48 games played last year. He averaged 10.1 points per game on 16.9 minutes per game. Walker was third on the team with a 16.2 rebounding rate. One thing Walker has been working on lines up perfectly with the biggest change Blair hopes to make to the team’s style from last year. To Blair’s point, the Vipers allowed opponents the second highest effective field goal percentage in the league. The offensive rating was high, but the defensive rating was low, which meant the Vipers were seventh in net rating. The two teams at the top of that category: last year’s finals matchup the Raptors 905 and the Austin Spurs. So, Walker has devoted a lot of his time to working on his rim protection and defensive rebounding. 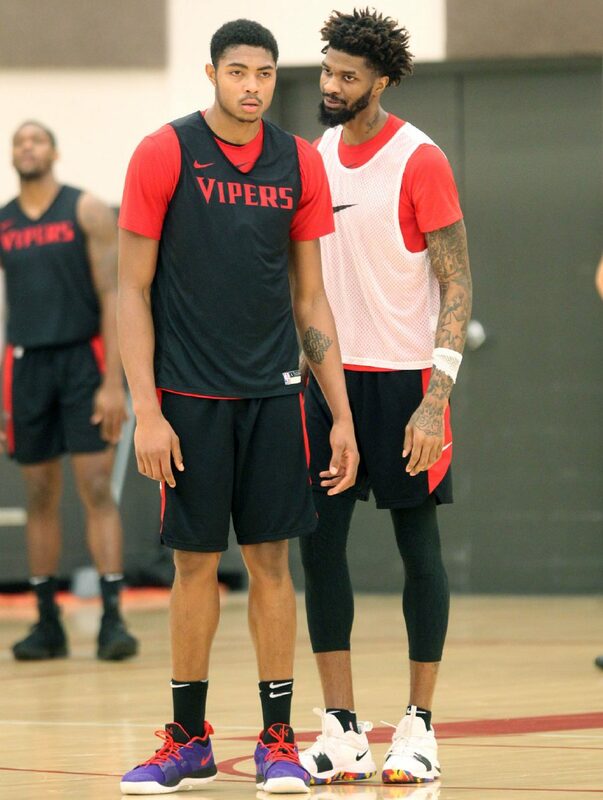 Walker is referred to by some of his teammates as ‘C-Wall,’ and if he can be that wall in the middle for the Vipers, it will go a long way to reaching Blair’s goal of a top 10 defense. Another key aspect to Walker’s defensive game is his ability to switch onto perimeter players and guard them effectively. “On defense this season, we are switching everything,” Walker said. “You will see me guarding the five. You will see me guarding the three. Sometimes you will even see my guarding the point guard. Walker has been working with some of the guards to prep for the added defensive responsibility. That isn’t the only challenging matchup Walker has drawn this year. Blair said Walker is almost always matched up with Caboclo during training camp to get both reps against big men. Last year, Caboclo split the season between the Toronto Raptors and the Sacramento Kings, mostly playing for their G-League affiliates the Raptors 905 and the Reno Bighorns. He averaged 14.2 points and 6.4 rebounds per game in the G-League. “They are both very versatile players,” Blair said. “Chris Walker is a roller, high-energy guy. Bruno has that same high-energy, super athletic, arms are long as all hell. But also he can shoot the ball very well. What makes the roster construction so intriguing is the amount of shooting the Vipers will be able to put around either of the two big men. Nickens has competed with some of the best shooters the Vipers have to offer in their impromptu 3-point contests. One shooter Blair has been really captivated by is two-way player Gary Clark, who played at Cincinnati last year before going undrafted and being signed by the Rockets. With Caboclo and Walker in the middle, shooters all around, and good defense on the other end, the Vipers hope to get back to the finals after missing last year.